I rarely post recipes, but, it’s a rainy Friday, and these new glasses seem to be screaming for a mixed drink. Novica. The glasses are so beautiful, I had to put them straight to work! So, here’s my recipe…it’s the perfect drink for a rainy Friday Happy Hour with your girlfriends. Like them? What a set for yourself? If you’d like to shop the NOVICA website I have a $50. gift card to giveaway. Simply leave a comment here and I’ll pick a winner at the end of the weekend. *Novica, in association with National Geographic, works directly with thousands of master artisans in Asia, Africa, and Latin America, helping bring their beautiful creations, and their stories, to collectors worldwide. The glasses are hand blown with a tortoiseshell appearance. Designed by Javier and Efren in Mexico. Each glass is hand shaped, resulting in each being slightly different from the other. Novica also carries a great selection of handmade fabrics, accessories, and jewelry. bloody mary is my kind of girl! I love that these glasses are handblown, each one-of-a-kind (tortoise-shell, no less), and that the company, Novica, is working to support artisans around the world. 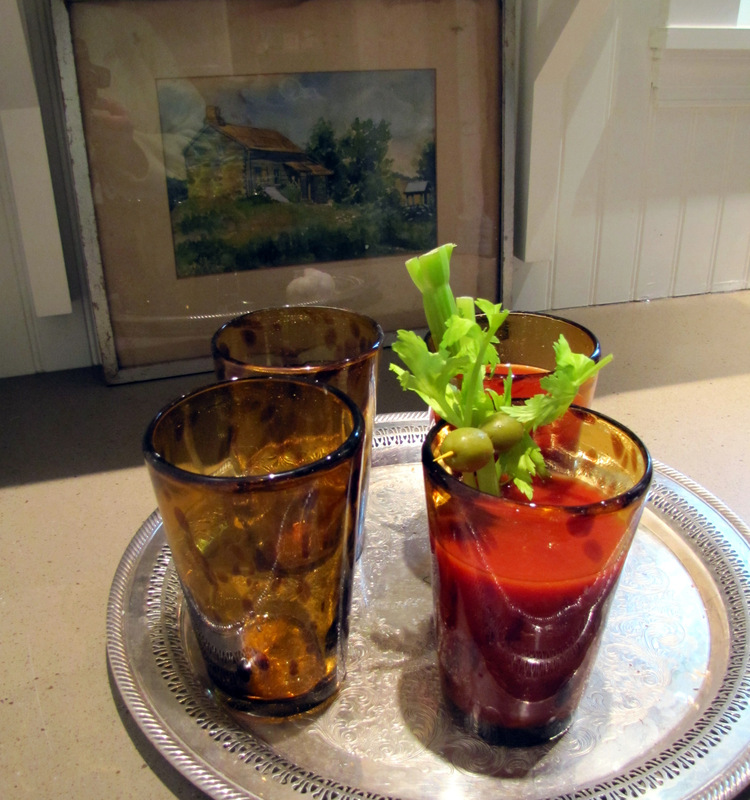 I'm not a drinker, but the Bloody Marys look yummy in these glasses, so I'd gladly take a swig. Gorgeous glasses! I would be happy to accept this giveaway prize! Happy Friday to you! MMMMM…. Looove a good Bloody Mary!!! Glasses are nice to- HAHAHA! I LOVE the glasses and I am so ready for a Bloody Mary right now!! Please pop my name in the hat! nice am thinking the ones with the bloddy marys are even nicerrrrrr!!! Beautiful glasses and looks like fabulous tasting BM. I <3 them. I wasn't familiar with Novica before now, thank you for the introduction. Handsome glasses. They seem to be sized for a full one hand grab, might even look lovely with beer too! I love happy hours with veggy servings. I'm screamin' for one of those …. YUM! While your bloody Mary's look delicious, I favor a frozen mimosa! Thanks for the chance to win. Those glasses are beautiful. I just found you blog through recommendations on my Google reader! Lucky me to find you as you are having a giveaway! 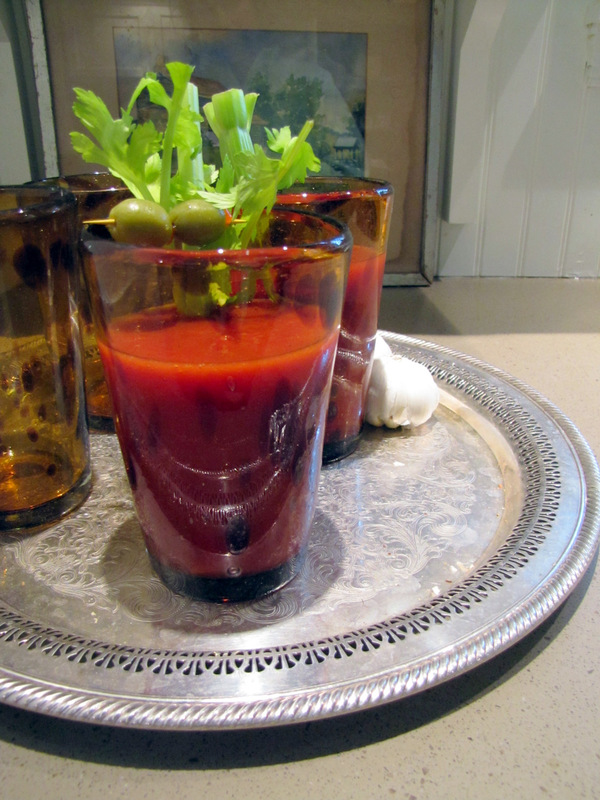 The Bloody Mary sounds mighty good too! I'd love to win and do a little shopping! !